Apples will keep for months if you choose them well and store them properly. Stock up while apples are in season, then take these steps to maximize their storage life and enjoy delicious apples all year long. Start with apples that keep well. Late-ripening varieties (those harvested in October) usually do best. These include Red Delicious, Ida Red, Winesap, Crispin, Stayman, Rome, Northern Spy, and Turley. You can store other apple varieties, but they won't last as long, so you'd want to use them first. Check here for More Apple Varieties that Store Well. Inspect all apples for bruises, cuts, bug damage and soft spots. Only perfect fruit is suitable for storage. Eat your imperfect apples, or use them to make applesauce, apple butter or pie filling. Sort the apples by size: small, medium and large. Since large apples don't store as well, this will make it easy to ensure that they get eaten first. It's also a good idea to sort your apples by variety. Different apples ripen at different rates, so if you store each variety separately, it'll be easy to eat the early ripeners first, while saving the slow ripeners for later. Place the sorted apples in boxes or baskets. To maximize their storage life, wrap each apple in newspaper before you place it in the basket. If one apple goes bad, the paper will protect the other apples from coming into contact with it. Store your apples in a cool basement, garage, shed, fruit cellar or refrigerator. The ideal storage temperature is 30-32°F with 90 percent humidity. Apples are likely to suffer freeze damage if the temperature dips below 30°; and will ripen quickly, if the temperature rises above 40°, so do your best to match these conditions. If you have room in the fridge for them, that's really the best place for them, since you won't have to worry about temperature or humidity deviations. 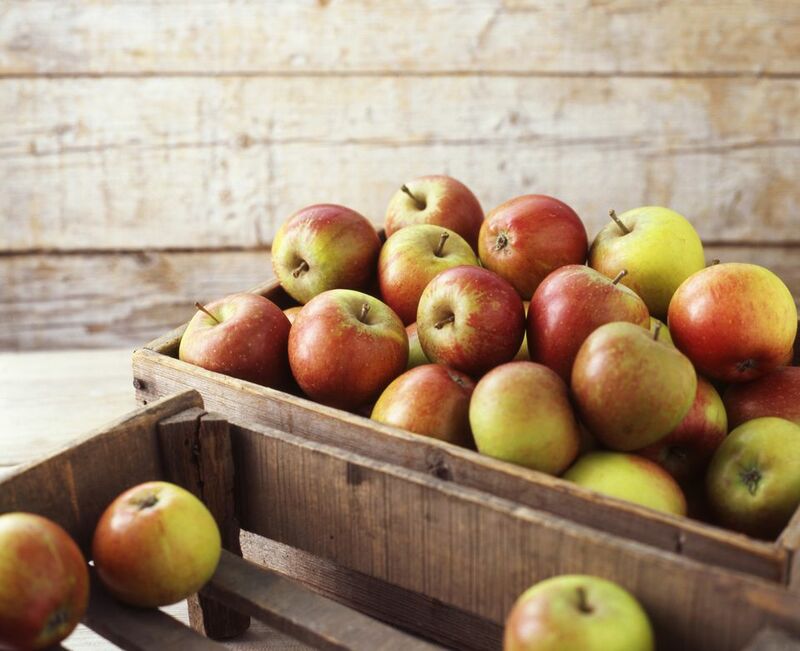 Check regularly for signs of spoilage, and remove any rotten apples before they have a chance to spoil the lot. Pick apples when they are ripe. Over or under-ripened fruit will not store well. Apples that have fallen off the tree are too ripe for long-term storage. Stick those in your fruit bowl, so they can be enjoyed right away. Store apples as soon after picking as possible. The sooner you get them into cold storage, the longer they'll keep. Avoid storing your apples near onion or potatoes. They'll readily absorb the flavor of other foods and could ripen prematurely. Expect your apples to last up to five months in storage (depending on the variety and storage conditions). Consult garden catalogs to see how long each apple variety is supposed to last. Then, eat your apples with the shortest storage life first.